'Project Nim': A Chimp's Very Human, Very Sad Life Project Nim is the new documentary about a chimpanzee raised in a human household as part of an experiment to see if chimps could learn language. Director James Marsh and two of the people who cared for Nim talk with Terry Gross about the controversial study. 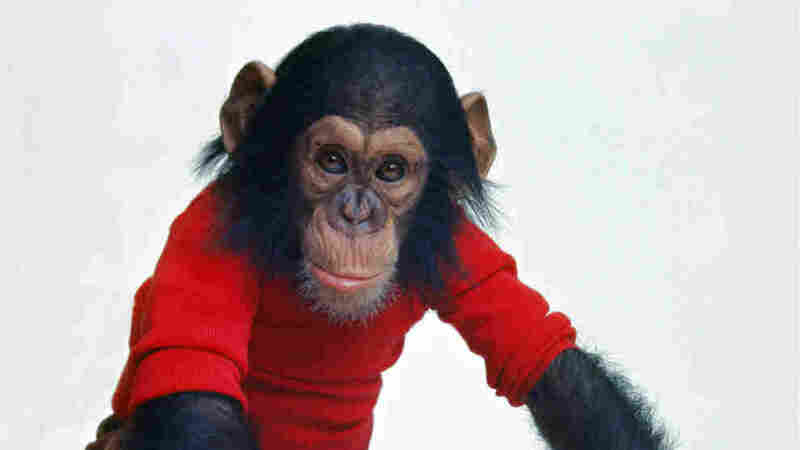 In the early 1970s, a chimpanzee named Nim was plucked from his mother's arms and transported into human homes in the hopes that he would learn sign language and open a window into ape thoughts. In 1973, an infant chimpanzee was taken from his mother's arms and sent to live with a human family as part of a Columbia University psychology experiment. The goal of the project was to see if the animal, named Nim Chimpsky, could be conditioned to communicate with humans if he was raised like a human child in a human household. He learned some very basic words in American Sign Language, but Nim continued to act like a chimp — he bit the children in the house and didn't understand how to behave like a human child. It was decided that the family could no longer care for Nim, and he was shuffled from caretaker to caretaker for several years. Nim and the many people who raised him over the years are the subjects of James Marsh's new documentary Project Nim. Marsh and two of the people who worked with Nim join Fresh Air's Terry Gross for a discussion about the film and about the controversial experiment. "The premise of the experiment was to treat him as much like a human child as possible and to give him the nurturing of a human child in order [to see if] he would behave like one," Marsh says. "And it was quite striking that there wasn't an investigation into what chimpanzees actually were or what they're like. And the wild animal comes out in him very quickly, and [no one] was prepared for that." "He needed diapers, he needed bottles, he needed feedings," Lee recalls. "And it was odd he was a chimp. But at the same time, there was kind of a normalcy about it in that he was just included in the family right away." While Jenny and her siblings went to school, Nim learned sign language with researchers at Columbia University. The goal was to open up a window into Nim's thoughts and to see if he could develop real language skills. When he came home each night, Nim would play with the Lee children and mimic their behavior. But as he aged, he became more aggressive — and no one knew what to do. "It was really the biting that became the big problem after maybe he was a year old, because it's painful and it can draw blood," Lee says, "and with human babies, you can teach them not to do that. And that was not something that Nim was able to learn to really control." Nim left the family's house and moved in with a series of caretakers before going to a primate facility on the grounds of the University of Oklahoma. 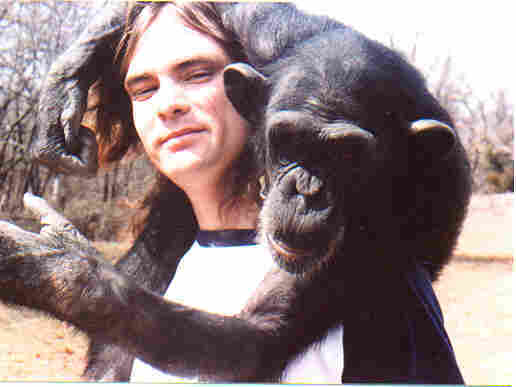 Bob Ingersoll (left) spent nine years with Nim, the subject of an experiment to see if apes could communicate with humans using sign language. Ingersoll is now the president of Mindy's Memory Primate Sanctuary. "You could read [fear and apprehension] through his facial expression and his body language," Ingersoll says. "It was very distressing to him and ... we were really worried about Nim and we spent quite a lot of time with him, making sure he was eating and drinking and not being picked on by the other chimps." "It was easy to hang out with him," he says. "He did for me the same thing that I think that I did for him, which was make him feel comfortable and certain and familiar with the situation." "He actually signed 'stone smoke time now' to us first," Ingersoll says. "We were shocked. Although we were familiar with chimpanzees that did things like drinking and smoke cigarettes and that sort of thing, I'd never had a chimpanzee request weed from me. That was an eye-opener." "What he needed at that point was to be with other chimps," Ingersoll says. "Chimps don't need to be with humans. They need to have a chimp life. So my own personal need to hang out with Nim or walk with Nim wasn't as important to me as doing the right thing for Nim. ... Chimpanzees in captivity is just not where they ought to be. ... I would hope that one of the lessons that we learned from Nim's life is that keeping chimpanzees in cages is torture and really plays havoc on their mental health."